PTMSC Blog : Spurting Love! In early spring, many of our Pacific Northwest marine invertebrate species begin to reproduce. Many of them use a process called broadcast spawning, where both sperm and egg are released into the water and external fertilization takes place. Most species will coordinate with the lunar cycle and all start releasing sperm and eggs at the same time; which can be a nice snack for other marine creatures feeding in the water column. Broadcast spawning can be advantageous because it overwhelms the waters guaranteeing that many fertilized eggs will make it to adulthood. Species that broadcast spawn do not have to compete with their offspring for food or space because the currents may carry them many miles away before they even become fertilized. 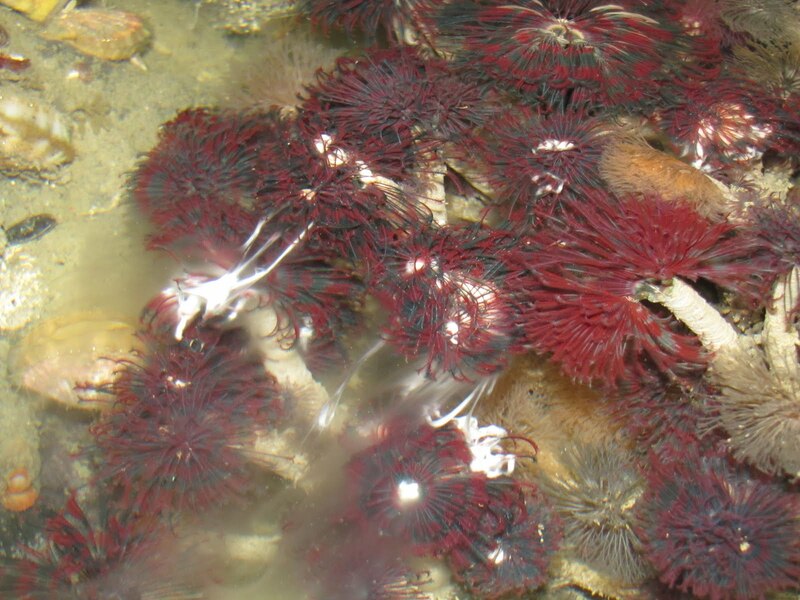 Viewer Tip: Look out for broadcast spawners on the beach in early spring; you may see some cloudy waters in tide pools from sea anemones, sea stars, or urchins. The Port Townsend Marine Science Center reminds you to use gentle, wet hands if you touch anything and leave tide pool animals where you find them. These simple steps will reduce any stress or impact to the animals. A Short video of a few broadcast spawners in our tanks at the PTMSC. Modes of dispersal of clonal benthic invertebrates: consequences for species' distributions and genetic structure of local populations. Fertilization in broadcast spawning marine bivalves is a small scale process: the Baltic clam Macoma balthica.